Who would have thought in 2016 you have multiple turntable options — not just from multiple manufacturers but multiple options from just one manufacturer. Audio-Technica has a range from simple home use to pro level equipment. 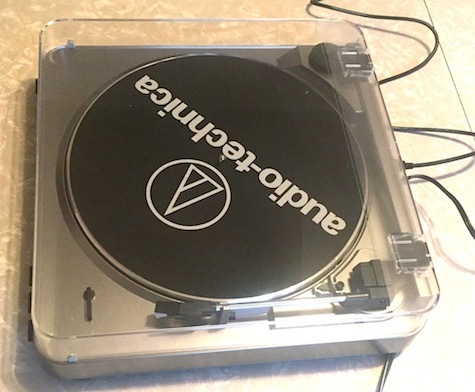 The AT-LP60-USB is their automatic USB turntable. 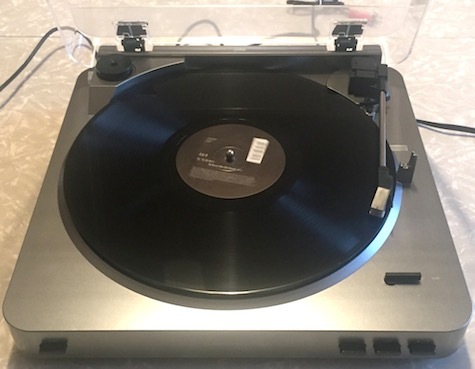 This is a belt-drive turntable with a USB output that allows you to convert your vinyl to digital, or play records through what most likely is your digital audio system. It comes with a USB cable, two RCA to mini-plug cable (one male, one female), 45RPM adapter, and cartridge with stylus. The one thing that this turntable does not lack is ways to connect. If you can’t connect it either to your computer or your audio system with the provided cables you are definitely dealing with some pretty exotic equipment and should probably should be looking for something else to use as a turntable, although I’m not sure what that would be. There is some minor assembly needed to get the turntable working, the biggest job being attaching the belt to the motor. This is a task that even the most mechanically deficient person can accomplish in a matter of seconds. After that it is a matter of putting on the slipmat, connecting to your audio output, and plugging into an outlet. 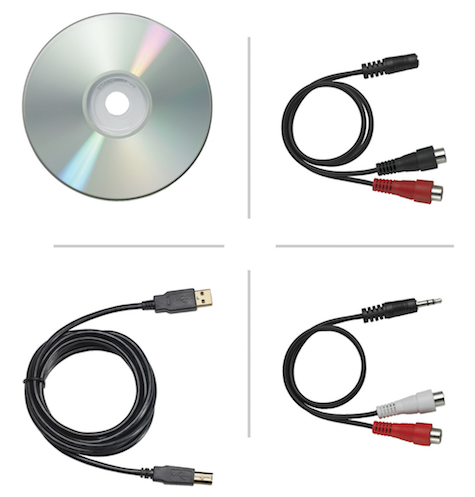 The AT-LP60-USB also comes with a CD with software to digitize your vinyl to digital files. The software provided is Audacity, the free open source digital audio editor and recording application. This to me was very confounding (see below). Audacity is a great piece of software and I applaud Audio-Technica for taking advantage of great open source software instead of making some awful proprietary software customers have no interest in keeping up to date and useful. I would have skipped the CD altogether and just pointed to the Audacity website in the included written manual for people to download. The CD version was a few minor revisions behind was is available currently, which may not be a huge deal but if a security release comes out this can become a problem. Also as a minor aside, the screenshots for the Mac OS instructions are clearly from the Aqua GUI days which is from the past. Audio-Technica, please update your manuals at least get to the brushed metal days. Using the turntable presents almost no problems. Place a record on, choose your speed 33 or 45, choose your record size 7” or 12”, and then press start. You can also pick up the tone arm and place it on the record if you want to start from some place other than the beginning of the record. The tone arm will return itself back to the resting position when it reaches the end of a record. Recording the signal to a digital one provides a decent quality, although it’s not very powerful on the low end. You can add some EQ and possibly compression to round it out. Audacity has a lot of these effects built in, but for the novice user this is too much to ask. If you are using this to make digital copies of vinyl records, you will need to definitely work on the signal before recording. Running the signal through a good amplifier and/ or EQ before digitizing is my suggestion. Get some help from a local or Internet friend who knows more about this process than you do to save time and stress. The AT-LP60-USB fits into the category of providing decent playback for nostalgia purposes only. If you are serious about digitizing a collection of vinyl you will be better served by spending a little bit more money on a better turntable. If you need a turntable to play your old records or even your new acquired records and have a digital only audio system, then the AT-LP60-USB can serve your needs adequately.